“The development of this app took into account many educational, communication, and technical factors…. a great option for beginning a comprehensive visual support program for communication for individuals with special needs. The apps support communication at all levels and there is potential for the apps to meet all current and future communication needs. The apps are fairly easy to use technically and are fully customizable so they can work for a variety of ages and levels.”. •Customizable communication boards using the template feature. For example, you could setup a template named “Favorite activities”, “Favorite food” or any teaching strategy classification like Categorized, Theme/Topic Based, T.A.L.K., Core Vocabulary, etc. 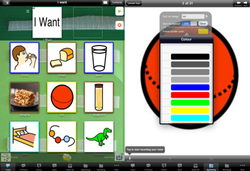 •Build preset picture sentences to provide prompts and teaches sentence construction. 'Fill in the blanks' feature to reinforce sentence building. •Text to image tool which allows you to type any text and save as image in different fonts and colors. Create helper words like ‘at’, ‘can’, etc. to form sentences. 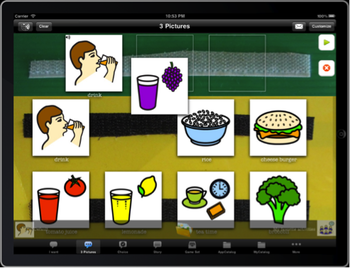 •Games section uses the image libraries to let you customize any number of identification and matching games and/or exercises that are beneficial at a cognitive level. •Customizable touch gestures, picture size, board background, position of communication strip, sound effect, edits on/off, hide/unhide tab bar and buttons to prevent moving to other screens accidentally and many more. •Text To Speech. No internet connection is required. >Synthesized voice supports English, Danish, Dutch, Finnish, Spanish, Swedish, French, Italian, German and Chinese Simplified. Color-coding system lets you use colored frames to represent agent, action, object, etc. The possibilities are unlimited! The student list feature allow caregivers or educationists to keep track of a list of students/users in the app. Each student can be assigned a set of templates to himself or herself. Once that is setup, the app will only display relevant templates.